Opera Software have announced the worldwide release of Opera Mini, the full Web browser that runs on almost every mobile phone, including low- and mid-end handsets. I’ve tried it, and I’m very impressed – it’s an improvement over the default browsers included on my Nokia 6100 and Sony Ericsson K750i – and it’s available as a free download. Go to opera-mini.com to find out more. Advertising executive and blogger Hugh MacLeod gives his 30 tried and tested tips for being truly creative. Acknowledging that everyone is creative from birth, the article suggests ways of tapping into that innate creativity. Warning: Slightly NSFW due to language. Google has been known to roll out new features to a limited audience in order to test the water prior to release. 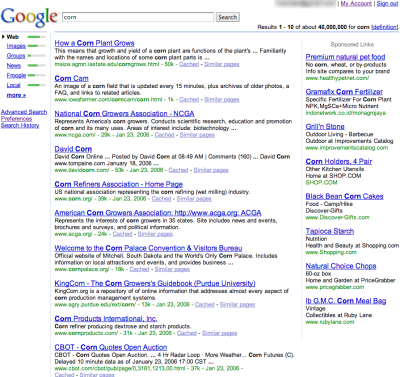 Flickr user Mamster is one of these lucky people, and has posted a screenshot of a new design Google are considering. It’s not drastically different, but I quite like it. Tunatic “listens” to your music and attempts to identify it. I used it to find out the name of a song I heard on TV, and it managed to get it. It actually managed to give me a title and artist for most songs I could throw at it, which is impressive considering services like Shazam charge 59p/song. Obviously it will only work when you are listening to music on (or near) your computer, but hey, it’s free. Tunatic supports Windows and Mac OS X. Talking of music from TV, I’ve just discovered Harvey Danger. Their song Flagpole Sitta is the theme tune to Channel 4′s Peep Show, and the band have just released their latest album as a free download. It’s actually pretty good, and if you want to support the artists, you can buy the album on CD or send an online donation. The download is in DRM-free MP3 format, so you are not restricted to a particular operating system, software or hardware player. And finally, I’ve also discovered an “electroclash” band called Client (thanks, Chris M!) Their music isn’t free, unfortunately, but I was interested to see that their site is powered by WordPress, a content management system used mainly for blogs like this one, but also capable of running full-blown sites such as Client’s. Yesterday I was invited to Newsvine (thanks, Eric! ), which describes itself as “a place where anyone can read, write and influence the news.” Lots of sites with similar philosophies sprang up in 2005; so what makes Newsvine different from, say, Digg or CommonTimes? Unlike Digg, which only covers technology news, Newsvine welcomes news on any topic. 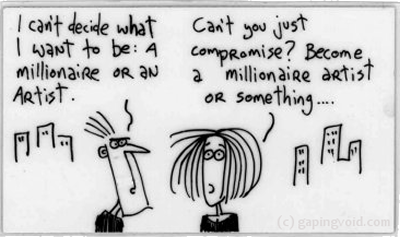 In this way, it is more analogous to CommonTimes. The main difference I can see is that Newsvine is somehow affiliated with the Associated Press, whose stories provide the content for the “wire” section of the site. This is something which its competitors lack – each story must be manually submitted by users.Then there is the “vine” section, which is composed entirely of user-submitted stories. The act of submitting a story is known as “seeding the vine”, and users are encouraged to do this by dragging a button to their Bookmarks toolbar which they can click when they find an interesting site or story. 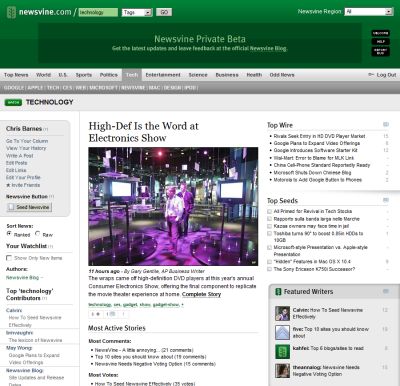 Each user’s “seeds” are posted in their own “column” (like a blog, which is available at username.newsvine.com) as well as the relevant area(s) within Newsvine, determined by tags or keywords. Perhaps the most novel twist, and something that no other “you make the news” community has tried before, is the notion of users getting paid to submit stories. The way it works is this – as a Newsvine user, you seed stories to build up your own personal column. Whenever someone views your column, you receive a share of the advertising revenue. This is not yet operational, is slated for release in time for Newsvine’s public launch. My impressions so far have been good – the site is nicely laid out and attractively designed, and despite occasional slowness, seems to be scaling well. It’s a little US-centric at the moment, but this will improve as more international users join the site. Newsvine is currently in private beta. I have a limited number of invites available – if you’d like one, leave me a comment. An end to comment spam bots on Digg? Social bookmarking and technology news website Digg has decided to implement CAPTCHA testing within the comment posting mechanism, presumably to stop scripts automatically posting unwanted comments on popular story pages. 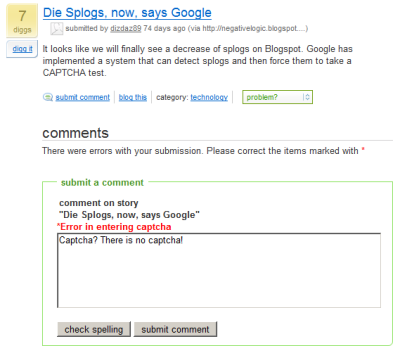 Unfortunately, neither a CAPTCHA image nor a box to enter your result is visible yet, effectively disabling commenting until Digg’s programmers get around to finishing their implementation. This is most likely a case of test code being pushed to the live server prematurely rather than a deliberate attempt to prevent comment submission entirely. Update: Oops, it seems like story submission is broken too. Step 2 spits out a load of SQL before the normal page content; the rest of the submission procedure (including CAPTCHA verification) appears to complete normally, but the story is nowhere to be found in either the relevant digg area nor my profile. Update 2: Looks like they’re fixing it as we speak. All pages now display “take a break, we’ll be back in 10. +digg”. Update 3: Back to normal, just about. They’ve removed the CAPTCHA verification for comment posting, and story submission is working too (the story I posting during their “outage” has now appeared). The top search box on every Digg page isn’t working correctly – it’s showing a blank search form instead of the search results I’m expecting – but apart from that, everything’s fine and dandy. According to this Ars Technica story, Google is putting together a suite of free Internet-related software to be distributed as a single installer. “Google Pack” is rumoured to include a customised version of Firefox, Adobe Reader, a Symantec antivirus solution, AdAware, Trillian and RealPlayer, along with Google’s own offerings. This is not something I’d have expected from Google, and if pack.google.com didn’t lead to a Google Accounts login page for beta testers (somebody’s broken their NDA, perhaps? ), I’d have dismissed this as a silly rumour. For one, Firefox is the only open-source title on the list – everything else is free, but only as in beer. The reasons for including RealPlayer, which is unpopular at best, and the Trillian multi-IM client, when Google have their own chat client, are speculated upon in the article. I wait with interest for the official release of the big G’s new product, and can only applaud them for at least trying to promote alternatives to the ubiquitious Microsoft offerings. Hopefully they do the “right thing” and give users to option to install only the applications they choose. Update: Google Pack is now available (public beta). You can customise the pack before downloading – RealPlayer and Trillian are not included by default, and Google Talk is also available as an optional extra.